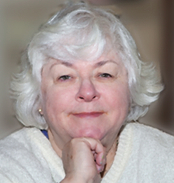 Lowell journalist Nancye Tuttle talks “Lowell Movie Houses” TODAY at 11a.m. on 980AM WCAP! Lowell journalist & cinephile, Nancye Tuttle. Fellow film fans, get yourselves to a radio or get access to a computer (for radio streaming) at 11AM today and hear Lowell journalist Nancye Tuttle on Merrimack Valley Radio 980AM WCAP talk Lowell movie houses with Guy Lefebvre, owner of Lowell Gallery. For anyone itchin’ to know more about Lowell’s amazing cinematic history, which includes the presence of over 40 theaters since the early 1900s, this radio segment is not to be missed! 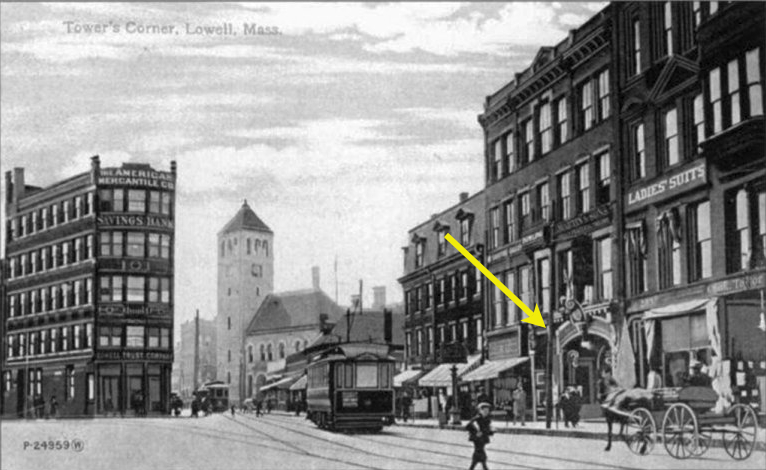 Here’s an added bonus: Did you know that the current location of 980 WCAP on Central Street was adjacent to Lowell’s renowned Theatre Voyons from 1908-1916? We’re sure our dear friend and film supporter Nancye will make mention of this as she sits right in the spot where thousands of turn-of-the 20th century movie-goers once sat. For those familiar with this part of Central Street — 241 through 245 — you’ll know that WCAP sits right above Cappy’s Copper Kettle, and it’s within this complex that Theatre Voyons once stood. Below is detailed info on what may have been considered Lowell’s theater district plus great photos of that section of Central Street, known as Tower’s Corner. The yellow arrow marks the Theatre Voyons, which was across the street from the Owl/Rialto Theater. Today, most of you may know the Rialto building as the B&M Railroad structure now owned by Middlesex Community College. Theatre Voyons (ca. 1908) in Tower's Corner, now the current site of Cappy's Copper Kettle & WCAP. (Courtesy of Cinema Treasures) | The Theatre Voyons, owned by J. S. Kittredge, was located at 241 Central St. in Tower’s Corner across from the B&M Depot from 1908 to 1916. It was located in a four-story brick building built by the Greenwood Brothers in the 1870s. According to the book “Americanizing the Movies and ‘Movie-mad’ Audiences, 1910-1914” by Richard Abel, industrial films were prominent in Lowell as were natural history series. Pathe’s “famous” Wild Birds in Theit Haunts (in color) was advertised at the Voyons in Lowell. Yet travel films were by far the m ost popular of all. In Lowell, the Voyons gave its audiences views of distant countries from Finland to Indochina, while the Scenic offered nostalgic “tours” of Ireland and Naples Italy. A larger view up Central Street of the Tower's Theater District, ca. 1912, with the Owl Theater (left) and Voyons across the street (right side of the photo). 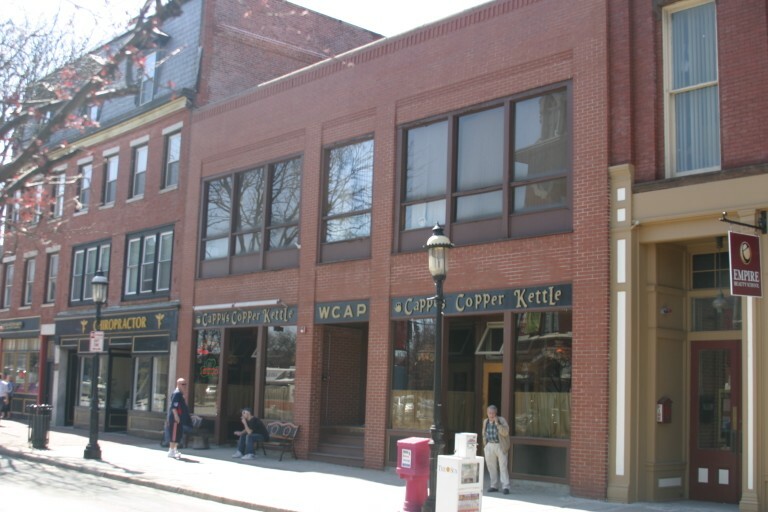 WCAP & Cappy's Copper Kettle today, former home of the Theatre Voyons. Stay tuned for more photos and fabulous Lowell movie history in future posts. In the meantime, we invite you to read Nancye Tuttle’s comprehensive and amazing piece, Movie Houses on the Merrimack, which she wrote for her 1993 exhibit “Picture It: Lowell Goes to the Movies” at Lowell’s Patrick J. Mogan Cultural Center. We are absolutely blessed to know Nancye, and are indebted to her for her support of the Lowell Film Collaborative, her love of the movies, and for being the keeper of Lowell’s remarkable movie history. Thank you, Nancye, and we’ll be listening today! This entry was posted in From the Lowell Film Collaborative, Lowell Film News, Movie Rants-N-Raves and tagged Americanizing the Movies book, B&M Railroad Lowell, Cappy's Copper Kettle Lowell, Cinema Treasures, Lowell Gallery, Nancye Tuttle, Owl Theater Lowell, Rialto Theater Lowell, Richard Abel, Theatre Voyons Lowell, WCAP Lowell. Bookmark the permalink.